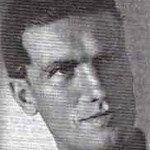 Adam 'Plum' Meredith (1913–1976) was a British professional bridge player. His origin was in County Down, Ireland. He was a key member of the British team which won the Bermuda Bowl in 1955. He won the European Championship in 1949 and 1954, and also played in 1955, 1957 and 1959. He won the Gold Cup five times, and the Master Pairs in 1960. Meredith was a bridge professional: he played rubber bridge for a living. He was not a writer, journalist or teacher of bridge as so many other players were. Plum was not only good-looking and intelligent, but had a highly original turn of mind. His personal honesty extended to his bridge career. He created a precedent when he withdrew from a British team on the grounds that a pair from a continental team were cheats. Others also thought so but had nevertheless played. At bridge he liked to seize the initiative early in a match, some of his bidding manoeuvres (which often centred round the spade suit) became legendary. He was also a remarkable dummy player. He was a strong and regular rubber-bridge player, and when he could he used a bidding system called 'Baron', and co-authored its text-book The Baron System of Contract Bridge with Leo Baron.